“Cancer should be considered and treated as a chronic disease… much like renal disease or heart failure. Once metastatic disease becomes apparent, a realistic goal of therapy is to attempt to stabilize it or slow its progression.” – 2016 American Animal Hospital Association Oncology Guidelines. Management of cancer in pets usually involves chemotherapy, while palliative care can also be provided. Both can range from oral medications given at home to injectable medications given at Upstate Veterinary Specialties. Surgery is used in patients where removal of the source of cancer is beneficial to overall prognosis. Because not all cancers are curable, they may require chronic therapy. Successful management of cancer frequently involves re-evaluation with the oncologist. Consequently, owners of pets with cancer often build a close relationship with their pet’s oncologist. With appropriate diagnostics, care, and follow-up, veterinary oncologists seek to give each pet the longest achievable survival time, while maintaining an excellent quality of life. 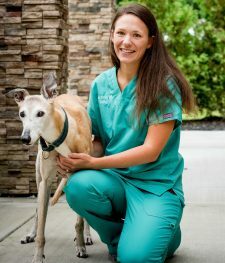 The veterinary oncology service at Upstate Veterinary Specialties offers comprehensive consultation, diagnostic services, staging and treatment plans for all cancers of cats and dogs, and other companion animals. Like people, pets can develop cancers that necessitate the expertise of a skilled and knowledgeable veterinary medical oncologist. Veterinary oncologists receive 3 to 5 years of additional specialty training beyond veterinary school to understand the way cancer develops, how it interacts with pre-existing conditions, and how to tailor a treatment plan that best fits each individual patient. Following an initial consultation, our oncology service works closely with the family of a pet to provide treatment, consistently being mindful towards the quality of life. All patients presented to the oncology service have an initial consult with the oncologist. The consultation will include a physical examination of the pet and review of all information sent by the primary care veterinarian (bloodwork, radiographs, etc. ), as well as a discussion of the pet’s pertinent history. Sometimes, additional testing may be required to confirm a pet’s diagnosis or to determine the local and systemic extent of their cancer. The veterinary oncologist can help to reach a definitive diagnosis, discuss treatment options, and provide a prognosis. Prior to any work being done, estimates of all costs (including diagnostic testing, medications, follow up visits etc.) can be provided to you.